Beyond Mere Mortals is a unique d20 superhero role-playing game that brings you all the excitement from your favourite comic books - brought to your game table from Noble Hero Press. Hero or anti-hero? Will you be the noble hero sent to save the damsel in distress? Or will you be the dark and brooding anti-hero sent to reap revenge upon the villains of your city? It is all up to you! Beyond Mere Mortals provides over a 100 new powers and feats, allowing you to create any superhero you can imagine. Once you've created your superhero, you're going to need gear and maybe a great vehicle and a sidekick. 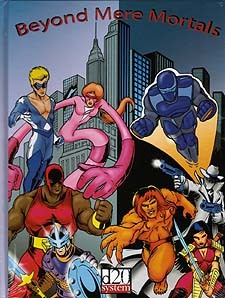 This book provides all of that and so much more, so pick it up and start fighting crime today!